"Bullets for Amy" is released. My historical, sort-of hardboiled dark fantasy short story "Bullets for Amy" is now available in issue 8 of Arkham Tales from the fine folks at Leucrota Press. The year is 1960. The place, Las Vegas. What's going down? A stand-up comic finds himself in over his head when his dancing girlfriend lands him in a hot spot with the local mob bosses. Who can save the day? Maybe nobody. Or perhaps a certain stage magician who has more tricks up his sleeves than Satan on a Sunday. And yes, Jason, it's a Dee tale. One of the greatest rock songs ever written, and performed in a fantastic, unique style. I remember watching this with the wife when it was live on TV in 2008 when Pete Townshend and Roger Daltrey were honored at the Kennedy Center Honors. My wife is more of a jazz fan, thus loves Bettye, and I'm a rock fun, thus The Who, so this was a perfect mixture for both of us. I think by the time the song was over we were both in tears. That's right. I got a new Kindle today. And towers did fall, kings were laid low and angels wept. 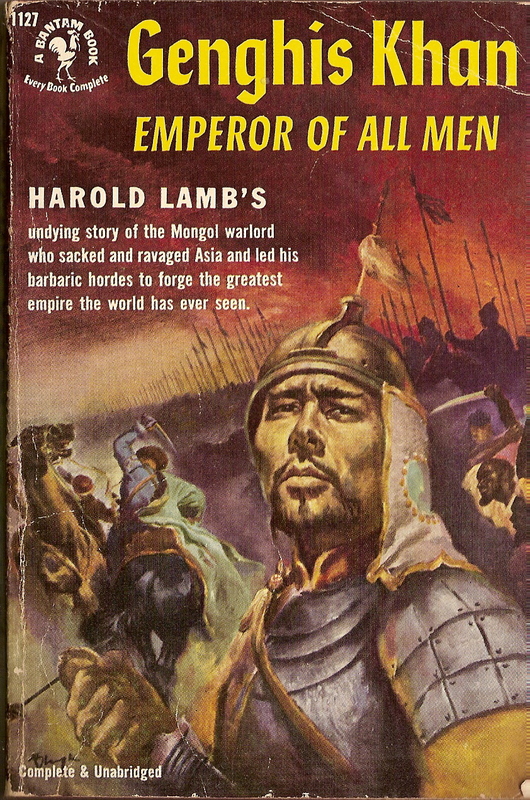 Notes: Some while back I exchanged books with Jason M. Waltz, editor of Rogue Blades Entertainment, and I ended up with this Harold Lamb novel in the deal. If my memory serves correctly, Waltz also received a Lamb book from me, so it was an even exchange, in my opinion. I've had this older paperback for a while, so it's about time I got around to reading it. I've read some Lamb before, and found it quite interesting. I'm sure this historical novel will be the same. Mini review: I have to admit to being a little disappointed, but I don't believe it is the author's fault. I believe my expectations were too high. The writing style is fine, so there wasn't a problem there. I'm familiar with some of Lamb's other writings, so it wasn't as it I was going in unprepared, but I felt there was a lot lacking here. The life and times of Genghis Khan felt glossed over to me, but then I might be too much to expect a scholarly treatise from what's basically a short paperback. I wanted more information, much more, but at least this book was a good place to peak my interest. My whining aside, I did learn a fair amount here. For one thing, I'd never realized just how completely brutal the Mongols were, with no respect for human life whatsoever. Also, I had not been aware to the extent the Mongol invasions had had against the incursion of Islam into Europe in the late Middle Ages. So, my eyes were definitely opened to a few things, and at some point I'll likely look more into the history of Genghis Khan and the Mongol hordes of the 13th Century. This concludes my series looking at books that have influenced me as a fantasy author. I have only read War and Peace in the last year, but it not only confirmed some of my own personal thoughts on morality, it also has had quite the effect on my writings. How could this be so from a book I've just read? War and Peace is a big novel, one of the longest ever written, so it might turn off some readers because of its length. The novel might also turn off some readers because it was written and initially published in the 19th Century, so the writing might not ring well with the modern reader's ear. And if you're an English reader, you're likely going to have to read a translation from the Russian, which throws in potential other problems. But for all that, I love this book. It was not a fast read for me, only about 10 pages a day, mainly because I was trying to study everything Tolstoy was trying to accomplish with each scene and the events and the characters. Tolstoy's themes for this novel about the French invasion of Russia during the early 1800s approaches the Christian, if not outright being about some Christian ideas, and at the least is about morality. With the scope of this novel, Tolstoy's focus is upon various ideas, so don't expect preaching or a simplistic plot. I won't go into all the details, not only because I don't want to give anything away, but because I also want readers to think for themselves instead of me (or anyone else, for that matter) telling them what to expect from such a novel. Writers can learn a lot from this novel, especially historical fiction writers and those who type away at lengthy, epic tales. The characters, the plot, the background, all is worth serious study here. Also, I want to add, now that I've come to the conclusion of my "100 Days of Fantasy" series, I want to thank the readers for following me along. I'm considering another, related, series next year, but I'm not giving any clues as to what it will be about. At least not yet. I hope you've enjoyed following my list of 100 books that have influenced me as an author. Thank you. Let me say right up front, Terry Goodkind is not my favorite author. He's not even my favorite fantasy author. He's a decent writer, but his prose doesn't blow my mind or anything. His plotting, as well, doesn't do much that's not already been done, nor are his characters all that unfamiliar. But, admittedly, I say that having only read this one novel written by the man. And I did, indeed, like the novel. So, with all my seemingly less-than-stellar evaluation of the author, why do I like Wizard's First Rule. One reason. The themes behind the tale. I don't want to go into a whole philosophical history, and I'm definitely not interested in a debate, but Goodkind's writing is based around objectivism, a philosophy of the individual that's sort of a meant to be an atheistic super capitalism (my apologies for objectivists who find this description lacking ... but I'm not going to go on for thousands of words trying to explain objectivism, especially when the reader can check it out at elsewhere). Objectivism originally became somewhat influential through the writings of author Ayn Rand, a favorite author of mine. One would think that with all my mushy goodness about objectivism that I would be a fan of the philosophy. I'm not. Or, at least, not in whole. I believe it is quite seriously lacking on a lot of philosophical fronts. But, that being said, I do believe objectivism offers a lot of positive aspects, the main one being a strong belief in the individual. Ayn Rand, being the originator of the philosophy, is still the best writing on the subject matter. Also, she's about the only fiction author of whom I'm aware who has written objectivist literature. With the exception of Goodkind. One of the thing's I liked so well about Goodkind's Wizard's First Rule was that I was nearly three-fourths of the way through the novel before I realized, "Hey, this guy's writing objectivist fiction!" I was quite surprised, pleasantly, actually. Not only had I discovered another objectivist fiction author, but I'd found one who actually writes fantasy, one of my two favorite genres (the other being horror). Now, allow me to backtrack just a little. I realize what I wrote at the beginning of this short article was less than flattering about Terry Goodkind's writing. I do not mean to imply he is an awful writer. No, not at all. But by comparison, he's no Rand. Besides, he must know what he's doing. He's a best-selling author, after all. Most of Tom Clancy's military thriller novels tend to be told on a big scale. There's often some major threat to the United States, a threat which is dealt with a small group of people often lead by Clancy's Jack Ryan character. Not all of Clancy's novels fit this basic mold, but I'd say nine out of 10 of them do. This is a personal tale, though it does span across decades and the world. Enter Navy Seal John Kelly during the time of the Vietnam war. Six months after the death of his pregnant wife in an automobile accident, Kelly saves a prostitute from drug dealers. Only the drug dealers eventually find their vengeance, severely wounding Kelly with shotgun blasts and torturing and murdering the prostitute. Eventually, Kelly heals, and helps himself to heal further through rigorous physical therapy. Then his own private war begins against the drug dealers. But in all this mess, Kelly is called upon to return to Vietnam to recover several POWs. The tale is more complex than that, but you get the gist of it. This is one of the more personal, though not autobiographical, tales from Tom Clancy and my favorite novel from him. Clancy, who can write an action scene, is in top form in this book. His writing is tight, filled with action, though sometimes a little too righteous (though admittedly, this is a novel of personal vengeance, and you can't get much more righteous than that ... and Clancy's themes tend to be pretty righteous and self-righteous anyway). Hasn't there really been enough talk, criticism and discussion about the Lord of the Rings? But one thing I rarely see in all that discussion is the various benefits of each individual book in the series. In my opinion, The Fellowship of the Ring is the best book of the trilogy. It contains great characterization, strong plotting and that strong feel Tolkien brings of doom overhanging a relatively benign world, specifically the artist-agricultural community of the hobbit characters. The Return of the King also has many fine points. But for me, as a writer, I was always drawn to all that extra information included after the end of the actual story, all the history and linguistic stuff. Then there's The Two Towers. This, the second novel in the trilogy, often seems to get short-shrifted. But that's kind of difficult to understand. For large sections of this book, not a whole lot seems to happen. SPOILER: Basically, pages upon pages are spent of Frodo and Sam, and later on Gollum, wandering through the woods or a swamp or parts of Mordor. It's just one, big long trek. For many readers, this is just downright boring. But for writers, there is much to be learned here. Much of that walking time in The Two Towers includes the inner thoughts, the inner struggle, with which Frodo is dealing as the carrier of the ring. To some, yes, all of this is boring. But to some readers, this is pertinent information, and it allows for building a bond with Frodo and the other characters. Writers can learn from this. No, one does not want to be a boring writer, but still, there are lessons here on how and how not to proceed with the inner mental workings of a character or characters. The tension is building in Frodo as he nears Mount Doom with the ring. Will he have the strength to drop the ring to its own doom? Or will the ring consume Frodo, making him an element of evil? Most readers know the tale and how it ends, as do many movie goers, so I won't give anything away. But I will warn fantasy writers not to dismiss The Two Towers. My Appalachian literary novel More Than Kin is now available in e-book format. But first, what is the novel about? Here's the description: Walt Johnson has been a rolling stone most of his life, moving from town to town and living on the edges of homelessness. Now he has run out of time as lung cancer has left him only months to live. Walt then begins a quest to find the son with whom he lost contact decades earlier. Out of money, he lands a job at a small-town restaurant in an attempt to save enough to buy a bus ticket to the last known whereabouts of his son. The friends Walt makes at his new job soon become family for him, especially 14-year-old Danny who is emotionally paralyzed at the loss of his own father in Iraq. Faced with Danny’s struggles to grow up and the struggles of his other new friends, Walt comes to realize he is not only on a journey to find his own son, but he is on a journey to find himself worthy of being a father. If you are interested, More Than Kin is available in multiple formats at the following places. Sometimes we all feel alone. And that is where the novel The Last Unicorn begins, with the protagonist alone. The tale is about a unicorn who believes she is the last of her kind in the world. Feeling lonely and wondering what has happened to all her kin, she sets out on a journey to discover what has happened to all the other unicorns. Along the way she has myriad adventurers, makes new friends and a few enemies, and discovers much about her world and herself. Eventually, yes, she finds out what happened to the other unicorns, and it is not something nice. Is this a tale of woe? No, not really. There definitely are some sad elements to this tale, but there is also some glory to be found in the end. Still, this is a tale of regrets, once it's all said and done. The writing here is superb, without being overly difficult nor overly literary, though still not quite simple. The characters are beautifully drawn by the author's words, giving the reader not only excellent visual ideas of these creations, but also an emotional enforcement that settles the characters in one's mind for a long time after reading the story. I first came to this tale in 1982 when Rankin/Bass released an animated film of The Last Unicorn. I was enthralled by the tale, and being a young fantasy writer wannabe, I set out to find and read the book. I'm more than glad I did, because it is one of the best single, stand-alone fantasy novels I've ever read. I've picked up a couple of Beagle's other books over the years, and while I found nothing truly wrong with them, I also did not find them extraordinary. Too bad, because I love The Last Unicorn. Maybe I should check out some of the author's other writings. I came relatively late to this 1985 Pulitzer-winning novel. The 1989 television movie came first for me, and I fell in love with the sweeping story and the epic characters. And it put the TV movie to shame, as good as it is. The plot is basically about some old-timers, former Texas Rangers, who decide to herd cattle from Texas to Montana. But that doesn't cover anything. There are multiple, complex sub-plots going on throughout this tale, and the characters themselves are quite complex and interesting. I won't say much more, because I don't like to give away too many details for readers who have yet to discover a book. It's funny, in a way. Some of my favorite novels are Westerns, as are quite a few of my favorite movies. But, for the most part, I don't enjoy Western literature all that much. I've tried, but a lot of it comes off as overly simplistic and often unbelievable to me. That's why I usually stick with Western history in my reading instead of Western fiction. Which is probably one reason I love this book, besides the quality writing. This tale is based upon real characters and real events, though the names have been changed and I'm sure events have been embellished upon for dramatic effect. Still, if every Western were written like this one, I'm sure I'd be a much bigger fan of the literary genre. Heck, I might even decide to write a few Westerns. This book is pretty much what the title tells you. It has many, many sections on most every known historical gunfighter and gunfight from the Old West of American history. In many ways, this is not the most exciting of reading because it breaks events down and reports them pretty directly, almost as would a high school history book. But that's actually one of the things I love about this book. It doesn't romanticize gunfights of the Wild West, but tells them as history has recorded them. There is some opinionated writing here from time to time, and the author does not get his facts correct every single time (at least in my opinion), but I'm willing to let much of that slide for the reason that much of the history of America's West isn't all that dependable anyway, especially when it comes to gunfights. Of course you'll find the famous gunslingers and fights here. The O.K. Coral, obviously. Wyatt Earp. John Wesley Hardin. Wild Bill Hickok. Names most armchair historians would recognize. But you'll also find out quite a bit about lesser known gunfighters, and you'll likely even be surprised when some people and events pop up that you've never heard of. The author went to some extremes to find out his information. As can be expected, for the most part, these are not gunfights as Hollywood portrays them. In fact, there's maybe only three or four out of hundreds upon hundreds listed here that would be anything close to what Hollywood often portrays as a Western gunfight. On the other side of that, there are a few gunfights here in which such wild and crazy things happen that it makes one think of the old saying that "truth is stranger than fiction." If you want to write about this time period, or if you're just a history buff, I highly suggest you pick up this book. A fiction writer can learn a lot from non-fiction. In my case, mainly being a fantasy writer, I often learn quite a bit from books about history. In this particular case, the book Ancient Inventions helped me learn just how intelligent and ingenious were ancient humans thousands of years ago. Did you know ancient Romans had computers of sorts? Did you know ancient Persians had batteries? And did you know ancient Greeks had robots of sorts? Probably not. Neither did I until read this book. Now, I don't want to stretch things too far. The ancient computers and robots I mentioned above were not electrical, but mechanical devices, but they still qualify as rudimentary devices in their own right and would have been useful even a hundred years ago in the modern world. And those batteries in ancient Persia? Archaeologists, historians and scientists are still not sure how or why ancient peoples in Persia had batteries. Did they even realize just what it was they did have? As a fantasy writer, I feel sometimes those of us writing in pseudo-historical worlds sometimes rely a little too much on magic. We want something fancy to happen, so we say it was caused by magic. But in the real world, the ancient peoples were just as intelligent as we are today, they just hadn't been around long enough yet to make all the discoveries we consider commonplace today. For instance, mankind has only been using electricity commercially for not even two hundred years; that's a pretty short period of time, historically. This book abounds with plenty of other inventions of ancient technologies, covering everything from ancient warfare to even sexual devices. If you want to learn, read this book. I'm sure there'll be more than a few surprises. One last one: Brain surgery. Yes, the ancients could even perform brain surgery. Is book store's bankruptcy a sign of things to come? In November of 1986 in Lexington, Kentucky, Joseph-Beth Booksellers opened the door of its first store. Operating as a successful independent book store and named the "1989 Small Business of the Year" by Greater Lexington Chamber of Commerce, the company soon expanded in the 1990s, eventually operating seven stores with the Joseph-Beth name and two stores as Davis-Kidd Booksellers. By the late 1990s, the company had stores in Kentucky, Virginia, North Carolina, Ohio, Tennessee and Pennsylvania. Unfortunately for book lovers, much of that is coming to an end. On November 11, 2010, Joseph-Beth Booksellers filed for Chapter 11 bankruptcy to give itself time to restructure within the company in hopes of surviving as a business. To that end, several stores will be closing, including a store in Cleveland, Ohio; one in Nashville, Tennessee; another in Charlotte, North Carolina; and one in Pittsburgh, Pennsylvania. At least for the time being, there are no announcements of further stores closing. If this were the only business within the book industry that is facing hard times, this might just be the story of one business forcing itself to make changes. But possibly this is a sign of the future. Rumors abound about the book store chain Borders potentially filling for bankruptcy, and the king of book selling, Barnes & Noble, is not free of such speculation, either. Even book publishers seem to be struggling to thrive, possibly even to survive, with the new digital publishing looming. What is bringing about these tough times for the book industry? Ask writers, readers, publishers and editors and you will get a lot of different answers. People don't read like they used to. Books have become too expensive due to printing and paper costs. Digital publishing is destroying traditional print publishing. The economy. The Internet. Amazon. But the book publishing industry has long been one to predict the sky is falling. Ask anyone who has been in the business for at least a couple of decades, and it's easy enough to find this out. It's obvious the book industry is going through major, potentially painful changes. As for what is causing these changes, the smart answer would be "multiple things," including all of those mentioned above. Are people reading less? Dozens of newspaper and media articles seem to say so. And the economy and changes in technology are obviously rearing their heads. Does all this mean more and more book-related companies will be filing for bankruptcy? Possibly even going out of business? The truthful answer is, nobody knows. But the smart money would be on "yes." With digital publishing, mainly through e-books, the book industry is changing every day. Most in the business tend to believe e-books will never completely take over printed books, but those with smarts realize e-books still might be able to take up as much as 50 percent of the book market, or possibly even more, and only in a matter of years. How many years? Some say two. Some five. Others, fifty. No one knows for sure. But it's a solid bet that with e-reading devices such as the Kindle and Nook becoming more common, and e-reader publishing sites such as Smashwords drawing in more publishers and indie writers, e-books are here to stay and will continue to be a growing segment of the reading market. Plus, more and more people are reading on their computers or through apps. Whatever will happen with the print book industry, everyone knows it's going to change. But for those of us who love books and reading, let's hope there will be as few bankruptcies and company closings as possibly. Even with a Kindle in our hands, many of us still love to stroll through book stores and many of us still like to have actual print copies of our favorite books. And for those who love Joseph Beth Booksellers, who perhaps even grew up with the store and love it, do not be overly worried. At least not yet. The company is not going out of business, and the main store in Lexington, Kentucky, is still there. Who knows? Perhaps this restructuring will make the company stronger, and it'll be around for a long, long time. Book lovers can only hope so. Especially me, because Joseph-Beth was the book store I grew up with, and I'd hate to see it gone. Someone is killing masked heroes. But who could it be? Since society banned super heroes some years back, the remaining super villains are all too old, dying off or being murdered themselves. Thus is the basic beginning plot of the graphic novel Watchmen. And it's just the tip of the iceberg. Watchmen takes place in an alternate universe of the 1980s in which Nixon is still president and technology is slightly advanced over what we have in the real world. Oh, yeah, and they have super heroes. Actually, all but one could be called masked heroes but not super heroes because they don't have any real super powers but are just great with their fists and have some special gadgets; but then you have Dr. Manhattan, who is the most powerful being on Earth, practically a god. All of this will sound familiar if you've seen the movie version of Watchmen. But if all you know is the movie, then you're missing out on a lot. Yes, I'll grant you the movie isn't bad, and it has quality special effects, fair acting (sometimes actually good acting) and the plot is okay. But the graphic novel version is by far superior when it comes to character development and plotting. You get to know the characters quite a bit more, and for the most part these are complex characters, not just cookie cutter figures. Also, while the plots between the film version and the graphic novel are quite similar, they also are quite different, especially near the climax. And then there are tons of sub-plots and side stories and ... and just little things in the background ... that the movie doesn't touch upon. I won't say Watchmen is my all-time favorite story told in a graphic format. Neil Gaiman has earned that, in my opinion. But Watchmen comes darn close, and it's told in a more mainstream (thus accessible) fashion than many other great graphic novels. But after joining all the hip cats over at Facebook and Twitter, now I've also jumped onto the tumblr bandwagon. Will it do anything for me? I don't know. Will it help my career as a writer? I don't know. Will it be a big, colossal waste of time? Probably. Only way to find out, though, is by diving right in. So, now you can also find me over at tumblr. In 1989, DC Comics under its Vertigo title released a four-issue limited series of comic books known as The Books of Magic. A couple of years later that series was collected into a graphic novel format and then released to the reading public. The series was popular enough that soon afterward the comic was made into a regular series. The original four-part series was written by the excellent Neil Gaiman, with artwork by various artists, all quite good. The original story lines concerns a British boy, Tim Hunter, who is contacted by four powerful mages of the modern age. Tim is told it is his destiny to be the most powerful wizard of his time, but is given the opportunity to turn aside from such a destiny. To help Tim make his decision, and to let him know some of what he's in four, each of these four mages takes Tim on a journey. One mage takes Tim to the past, and shows him many occult entities and events. Another shows Tim around the present world of magic. Yet another takes Tim to other mystical realms. And finally, Tim goes on a tour of the future. Unfortunately, I've made this sound all rather dull. That's because I cannot compete, and have no intention of competing, with the likes of Neil Gaiman. It would be a foolish writer who would do so. But imagine Harry Potter living in a much, much darker universe than that of Hogwart's. If you can imagine that, you'll have a pretty good idea of the world of Timothy Hunter. Honestly, I find The Books of Magic to contain some of Gaiman's strongest writing every, in my opinion. And not all is dark here. There is also plenty of humor, though some of it is dark humor. If you love graphic novels, reading about the occult or just like Neil Gaiman's writing, do yourself a favor and snag up The Books of Magic. You won't regret it. From time to time I post about weapons I have personally owned or have, at the least, used enough to have more than just some familiarity with them. One might ask, "Why does a writer post about weapons?" 1.) I write fiction. A lot of fiction has weapons. I like to know what I'm writing about. Unfortunately, I've run across too many writers who don't know anything about weapons, and often enough it shows through in their work. 2.) I enjoy studying, reading about and using practically ... weapons, of all types and all cultures and historical eras. That simple. Today, I'm writing about my favorite knife. 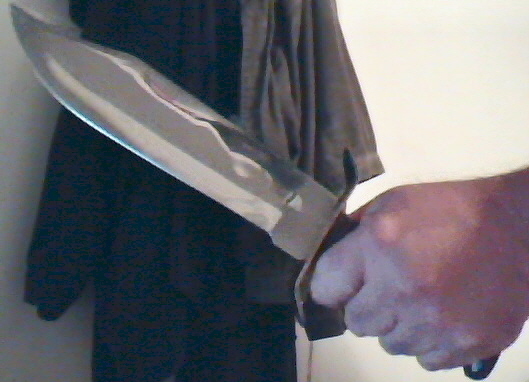 It's a cheap stainless steel Bowie knife I think I paid something like $20 for. This is actually my second of such knives, the first one having been given to a friend some years ago. Anyway, I can't tell you what company makes this knife. There was no manufacturer name on the box nor on the knife itself nor on the leather sheath. By all reasoning, this should be a crap knife. First, it's only stainless steel instead of high carbon steel (aka. battle-ready steel). The blade is made in Pakistan, which in my experience is not a great place for making sharp instruments. And it's rough all the way around, obviously almost home-made, though more likely slapped together in some sweatshop. Still, I love this knife. It's a good, solid piece of metal. No, I wouldn't want to take on a grizzly bear with it, even if it is 15 inches long, but for around the camp site or just out in the woods, it serves its purposes. And what are its purposes? 1.) As a tool for whatever purposes I need it for, and 2.) to make me feel just a tad better about being in the woods without a firearm (and for any gun haters who think I'm a nut for wanting to pack along a firearm when I'm out in the woods ... all I can say is, you apparently haven't had the same experiences back in the woods that I've had). So, yeah, it's just a cheap knife of not-so-great quality. But the price was right and it does what I need it to. And again, I'm not hunting boar with it (though, now that I think about it ... hmm, it might make a good spear head), and it's not as if I'm storming the beaches of Iwo Jima or something. Another reason I like this knife is for its simplicity. No fancy clips. No artsy engravings. Just a big, long blade, a wooden handle and a brass cross-guard. This non-fiction book has some personal importance for me. My grandfather bought it for me when I was about ten. He wasn't a man for literature, but he knew I loved books and each year he got me a subscription to Reader's Digest magazine and from time to time he would be me specific books that were published by Reader's Digest. This was one such book. My favorite, in fact. Though I was young, I knew I wanted to be a fiction writer someday. At the time, my interests were mainly in fantasy, though I would discover horror in a few more years. I was also always interested in history, and things that seemed just a bit odd. This book brought all of that together, my love for history, fantasy and things that were odd. Mysteries of the Unexplained is a sizable book, physically and in its number of pages, and within there are tons and tons of articles about histories of world histories, covering such topics as the occult, ghosts, vampires, mysterious disappearances, mysterious historical figures, ESP, UFOs, alien abductions, etc. For the young me, this was like having an encyclopedia of the supernatural. In one book, I could find out at least the basics on just about everything weird and unusual that I could ever want to know about. Keep in mind, this was decades before the World Wide Web came along, and while I could have found much of this information in a big library, it was a matter of pride for me that I had all this information at home in my room. And it was good, interesting reading. No dusty, boring text here. There were also plenty of images to keep a boy's interest, from photos to maps to what today I realize is smart book design. I couldn't have asked for anything better as a boy, and my grandfather realized this to some extent or other. Even today, I'll turn to this book from time to time when I'm want a refresher about a piece of occult history, or a fact about a mysterious figure out of history, etc. In case you haven't already heard, the New York Times has announced that after the first of the year it will add rankings of e-book best sellers. No, those rankings won't be decided only upon Amazon's listings, which is as it should be. Amazon might be King, but the pie is growing larger all the time. Actually, it's somewhat mysterious how the NYT will put together this ranking list, but I don't think it's anything to be concerned about. No conspiracy theories here. The NYT book rankings have always been somewhat complicated, based upon figures from different sources, including retailers, data-tracking companies such as Royalty Share, etc. One thing this means for indie writers is that this opens up yet another door for the indies to compete with the big print publishers. If an indie writer can really push his or her e-book, with some help and some luck it's not impossible that writer couldn't make it onto those NYT rankings. This is an ongoing series looking at books that influenced me as an author. During his much-too-short life of only 49 years, Karl Edward Wagner was known for a few things. He was known as a horror/dark fantasy author, mainly the stories and novels involving his Kane character. He was also known as the editor of numerous horror anthologies. And he was known to party hard. I first discovered the writings the Wagner through this book, The Midnight Sun, a collection of his Kane short stories. This particular book was published in the early 2000s by Night Shade Books, a known publisher of fine works of speculative fiction. Why did I get this book? Well, I had heard of Wagner as an editor, but I had never experienced his actual writing despite being told by numerous sources that he was a quality author. Also, I myself tend toward mixing fantasy and horror in my own writings, and I had heard Wagner was known for this. But the book was difficult to find when I went searching for it. No book stores had it. The publisher, at least at the time, was no longer printing it. And Wagner's older works, his novels, were particularly difficult to find, and I spent weeks upon weeks scouring used book stores for anything by Wagner. Then one night I was scanning through eBay, and sure enough, this book was available. I snagged it up, and a few days later the book arrived in the mail. I've been thankful ever since, and hold this book in high regard. Wagner's short stories in this collection pinpointed particular times in the life of his Kane character, initially a swordwielding mage of extreme power who is immortal. Eventually the reader figures out this Kane is actually the Cain from the Bible, or at least some version of Abel's brother. The reader also discovers that Kane is quite ruthless and possibly insane. Also, being immortal, Kane exists in many worlds in many different times. Some of the stories in this collection are in another world seemingly far in the past, but a handful of the tales are set in modern times. Throughout these stories, Kane seems to have one goal, vengeance against God, and Kane often goes to extremes in searching out this vengeance. Kane is rarely likable, though he can at times be somewhat honorable. Often he is ruthless to the point of betrayal, even to savagery. He doesn't sound like a very nice person, now does he? But his tales are still fantastic. The writing is strong here, mixing darker elements into fantastic worlds in a manner as strong as the writings of Lovecraft but sometimes with the pop culture knowledge of Stephen King. Many of these tales are not for the weak of heart, though a few are downright sentimental. More than anything, Karl Edward Wagner showed me how horror elements could be mixed with Sword & Sorcery fantasy and still come off strong, quite strong, when done correctly. As a writer, I can only dream to be a hundredth as good as the tales in this collection. Coma is my favorite song from Guns N' Roses, though it's not a tune you'll hear on the radio, and not often in concert by the band because it is a difficult song to sing. In an interview, Axle Rose once said, "I think one of the best things that I've ever written was maybe the end segment of the song 'Coma.' " And I can understand why. It's an intensive song, and the ending can be quite gut wrenching to listen to. Or, at least, that's how I feel about. So, here are my favorite lyrics from the song, taken from that "end segment" Axle mentioned. I think it's his best writing to date. Make sense of it, if you can. It's kind of hard to believe. And there's no way out alive. No one else can heal your soul. While you watch them waving goodbye. It was nobody's fault but your own. For a way to spend our time. Some of the best and most beautiful firearms in the world, whether for civilians or law enforcement or military, are made in Italy. From shotguns for hunters, remakes of historical firearms for collectors, and more, Italy spouts numerous manufacturers of quality weapons. Gun enthusiasts, military veterans and law enforcement throughout the world all know about Beretta. This company is the most famous of all Italian firearms manufacturers, mainly because numerous military, law enforcement and intelligence agencies throughout the world have selected Beretta weapons, often sidearms, for use. And it's no wonder. Beretta makes some fantastic weapons, from its famous pistols to quality shotguns and sometimes even futuristic-looking firearms, including sub-machine guns. Beretta weapons are not cheap, at least not compared to lesser manufacturers, but the prices are still usually within reasonability, especially considering the quality. Having been owned by the Beretta family for more than 500 years now, this company has expanded and now has plants outside of Italy, including one in Accokeek, Maryland, in the U.S. This company is one of the more versatile listed here, at least when it comes to the variety of firearms they manufacture and sell. They make plenty of modern versions of historic firearms, making this company popular with re-enactors and the the cowboy shooting crowd, but they also make several modern firearms, drawing some support from the self defense folks, enthusiasts, competitors and collectors. This company even makes and sells some black powder weapons. The company is stationed out of Brescia, Italy, but they also have a U.S. headquarters in Dayton, Ohio. I don't have any experience with Chiappa firearms, but I've known several people who have and they have nothing but good to say. Oh, and the prices aren't too steep, either. If money is no object or you're willing to take out a decent-sized loan, and you love the idea of owning a fine shotgun for hunting or trap shooting, you will want to consider Caesar Guerini. Operating out of the Gardoneval Trompia, as do several companies on this list, this manufacturer puts out over-and-under shotguns, semi-auto shotguns and several competition shotguns mainly for trap shooting. You were warned, however, because the prices of these firearms run into the thousands of dollars. The guns from this manufacturer are quite beautiful, though they tend to be not as artsy as those of some others on this list. Bolt action rifles. Double barrel rifles. Big game rifles. All these and more are made by the folks at ZanardiniArms in the Gardone Val Trompia in Italy, a region famous for fine firearms manufacturing. These guns are quite unique, featuring engravings that are beautiful piece of art. There are several other gun manufacturers on this list that make beautiful weapons, but personally, my favorite for artistic value is Zanardini Arms. Please click on the title to check out the weapons from this gun maker, because these guns are truly a sight to behold. Keep in mind, these guns are expensive, running into the thousands upon thousands of dollars, so they're not for everyone's budget. Still, the craftsmanship is solid and inspiring. This company, working out of the Gardone Val Trompia, focuses upon making replicas of historic American firearms, which makes Uberti popular among cowboy action shooters, civil war re-enactors, and collectors.Uberti's weapons mostly are from the American 19th Century period, and the company has a wide variety of lever-action rifles, single-action pistols and other firearms of that time. I've personally owned a couple of Ubertirevolvers, both 1875 Outlaws (modern remakes of Remington revolvers first made in 1875), and I have nothing but good to say about those two handguns; they were of quality make and performed like a dream, being better guns than I am a shot, to be honest. There's long been a rumor that film director Sergio Leone usedUberti firearms in the 1960s for his Dollars Trilogy movies, but I do not know if this is true or not. Also, I wanted to add that Uberti's pricing is quite reasonable, in my opinion, and they also make and sell black powder arms. Like several other gun makers on this list, this company works out of Brescia, Italy. I don't want to sound snooty about it, but if you have to ask about the prices of these weapons, you probably can't afford one. Yes, they're that expensive. I'm talking put-off-paying-for-your-kid's-college expensive. But that's to be expected from such fine, quality collectibles as the classic shotguns made by this company. If you are into collecting beautiful firearms that can be considered artwork, this might be the company for you.Perugini & Visini focuses almost entirely upon hunting firearms, double-barrel shotguns, over-and-under shotguns, double-barrel rifles and even a single-shot rifle. These guns are beautiful. They are so nice, I'd almost be scared to fire one. Especially considering the prices! If you plan on buying a weapon from this manufacturer, be prepared to get a second mortgage on your house, because these firearms, new, are going for $25,000 (U.S.) and higher. But considering each of this company's weapons are handmade and made to order, you can expect the quality to be high. This gunmaker works out of Nuvolera, Brescia, Italy. I wanted to point out in case you've not noticed by now, that while most of the links to these firearms manufacturers lead to pages in Italian, nearly all of them offer translation pages in English and sometimes other pages. Okay, now if you are into shotguns that look like pieces of art but are also quite functional and of fine quality, this is the manufacturer for you. Most of these are double barrels, though there is one single barrel, and all of them have fantastic engravings that must be seen to believe. Truly, these shotguns are artwork to make any artist proud. Like a few other companies listed here, this one works out of the ValleTrompia in northern Italy, a region known for firearms manufacturing. When you think of big bore rifles used for hunting big African game, this is one of the companies that comes to mind. This company makes several varieties of shotguns, but also some rifles for big game hunting. These are just pretty weapons, with fine engraving work all over the metal and polished woods that can make you teary-eyed just looking at them. Okay, I'll admit to some exaggeration, but these are darn fine weapons to behold. And the quality craftsmanship shows through, as well. The one drawback for many firearms enthusiasts is the pricing. Guns from this company tend to cost more than $10,000 (U.S.), so be prepared for some sticker shock. It's up to you whether or not the price is worth it. Can you guess where these fine firearms are made? If you guessed the Gardone val Trompia, you are correct. Okay, I lied. If you've kept count so far, this would actually be firearm manufacturer No. 11. I just couldn't help myself. There are so many great companies in Italy that make solid, great-looking guns, I just had to add a bonus company. Working out of the Valle Trompia in northern Italy, this company produces some of the finest shotguns in the world for hunters and collectors, though considering the prices, probably mostly for collectors. How much do these guns cost? Usually five figures. I'm not kidding. You could spend as much money on a Piottishotgun as you would for an automobile. But this company's shotguns are beautiful, each being unique, and are quite impressive. These shotguns are all double barrels, some being side-by-side and others over-and-unders. One unique shotgun this company manufactures is its Mod. Serpentine Side Lever, which houses the lever for breaking the gun open on one side instead of on top, which is much more common. Ty Johnston is the author of a number of fantasy and horror novels and other books, and he writes weekly articles for the role-playing gamer site Nerdarchy. This is an ongoing series looking at books that influenced me as fantasy author. Do I really need to go into The Lord of the Rings? I mean, come on, the thing is about as popular as the Bible anymore. It seems everyone has read the books, seen the movies, played the video games, etc. It's a quest story to save the world, okay. There, enough said on the plot. If you've lived under a rock for the last few decades and aren't at least familiar with The Lord of the Rings epic fantasy trilogy, then you probably should be. It's like Star Wars. A common part of pop culture everyone should be aware of. Sound a little testy there, don't I? But I don't mean to be. And no, I don't hate this series of books or anything like that. I've enjoyed them immensely over the years, and read each of the books multiple times, but I kind of feel, "been there, done that, slew some orcs, bought the T-shirt." It's like having to listen to Sweet Home Alabama or Stairway to Heaven one more time. I don't really need to. But that being said, The Lord of the Rings has a lot to teach writers, specifically fantasy writers. Heck, most modern fantasy fiction somehow or other has Tolkien to thank in one way, shape or form. If nothing else, his popularity and that of his books helped lead to the popularity fantasy literature enjoys today. What can a fantasy writer learn from The Lord of the Rings, specifically the final novel of the trilogy, The Return of the King? How about immersion. What am I talking about? About making your world real to your readers. About bringing breath to your characters and textures to the world they walk in. The story of The Lord of the Rings itself shows Tolkien's work about building a world and a plot that immerses the reader into his fictional reality. But more importantly, at least in my opinion, were all the extra appendices Tolkien stuck in at the end of The Return of the King. Remember that stuff? The pages of history about Middle Earth. The text about the languages of Middle Earth. The religions, etc. I'm not saying a writer has to include all that information in his or her stories and novels, but some readers enjoy that stuff. And, at the least, the writer should be vaguely aware of that type of information. If not, then your world could feel sort of flat and dull to readers. So, that's one thing I learned from Tolkien, and I thank him for it. I've never minced words about my being a writer who was influenced by comic books at a young age. If not for comic books back in the 1970s, I might never have become a lover of reading and eventually moved onto reading prose works. But of all the comic book stories I read back then, one of my favorite has always been the multi-part tale that lead up to issue number 200 of the Fantastic Four comic book. What happened? Doctor Doom, a longtime foe of the Fantastic Four, kidnaps some of the members of the super group. Then he uses them to clone himself a son, a super super-powered being who eventually has to be destroyed by Doom. When the finale finally arrives, Doctor Doom has to face off with Reed Richards, also known as Mister Fantastic, who is the leader of the Fantastic Four. The battle was epic, at least back then for comic books. The winner? Well, it's not likely you'll run out and look up a copy of this old comic, so I'll tell you. Reed Richards. Like you couldn't have figured that one out, right? Doom is driven insane by seeing thousands of images of his scarred face in broken glass, but don't worry. He'll get his act together again eventually and show up once more. From a writer's point of view, this story taught me much, especially about writing epic stories. Everything in this tale was BIG and IMPORTANT. The characters were big, bigger than life. The plot was big, spanning continents. The battle at the end was big, featuring swinging fists and super powers and all kinds of crazy stuff. Like I said, everything here was BIG, BIG, BIG! And if you want to tell a solid story, a story that's bigger-than-life in scope and characters, you could do far worse than to study issues 197 through 200 of Fantastic Four, especially the ending in issue 200. Just in case you didn't notice, the famed Jack Kirby did the artwork for the cover of this issue. Notes: If you are trying to make it as an indie author, aka a self-published author, in this modern digital world, you really need to be checking out the blog of paranormal romance indie author Zoe Winters. Though I don't normally read paranormal romance books, for some little time now I've been following Zoe's career and some of her advice. Because she has a lot of good advice to give! Zoe can be quite opinionated at times, but I find her funny instead of aggressive, and in my experience she only gives out grief to people who deserve it. Anyway, Zoe recently released this e-book about her path to successful indie writing/publishing, and I couldn't turn down an opportunity to read it. 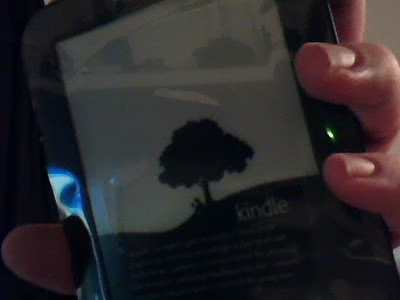 Mini review: Indie author beginners, I highly recommend this little e-book. No, it won't hold your hand and tell you every single, little step to take, but it's not too far from that. At the least, this e-book offers plenty of good advice, and it points you in the right direction. Wish I'd written it, honestly. This is an ongoing series looking at books that have influenced me as a fantasy writer. To be fair, Dennis O'Neil penned the main story of this comic book, and one other. World's Finest was made up of one main story plus a handful of shorter tales, and other writer's worked on those other stories. But I'm focusing on the cover story. A purple werewolf. From Krypton, Superman's home planet. Maybe, maybe not. But it didn't matter because it was just a comic book and we knew the heroes would win in the end. This comic book was from back in 1979, so it was before comic books had become dark and gritty and ... well, had become more adult. Not that there's anything wrong with more modern comics, because I've enjoyed many of them and consider some downright literature. But I also have a fondness for the old-style, somewhat goofy comic books. Back when spandex was still considered hot stuff. By today's standards, many of the story lines would be considered silly, sometimes awful, but not always. And still, even if some of the stories were a bit childish, they were written for the target audience, children. 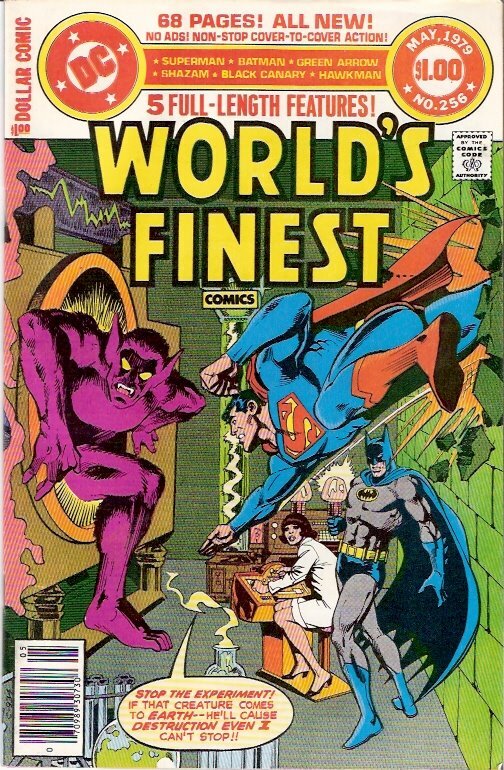 As a writer, I've learned a lot from comic books over the years, and this particular issue of World's Finest always had a strong appeal to me because it was the first comic book I remember reading that included more than just one story and one main character or group of characters. Batman and Superman had the cover, but inside were also tales of Green Arrow, Black Lightning, Black Canary, Hawkman, Captain Marvel and a few other side characters. To the nine-year-old version of me, this was more than just a comic book. It was a new universe, one that featured all possibilities and any kind of character. And yes, it was all kind of silly. Nuthin' wrong with that from time to time. So I'm browsing through a used book store yesterday when I realize the song playing in the store is from Smashing Pumpkin's Mellon Collie & The Infinite Sadness album. I like the album, so I hung around to see if just the one song was playing or if it was the whole album. It was the whole album. Which was great for me, because I hung out to hear four songs total, and it was great for the store because it kept me in there longer and I ended up purchasing a couple of more books than I would have. As I'm checking out at the front counter, I realize there's only one person working the entire store, a young twentysomething, which is no surprise since there's a university dorm literally just across the street. I compliment on his music, and thank him for it. He looked at me, smiled, and said, "Yeah, I love the old stuff." Then I realize when the album came out he was probably just out of diapers. Hey, at least somebody still listens to good music, even if it is "old." Imagine an empire so humongous it stretches across the Milky Way galaxy. Imagine a mathematical formula that can actually prove future events. Then imagine that formula predicts this galactic empire will soon crumble and a new dark ages lasting at least 30,000 years will follow. If you can imagine all that, you get the gist of Foundation by Isaac Asimov and the beginning of a highly regarded series of books in the science fiction genre. What happens next is a group of people try to find ways to circumnavigate, though not necessarily halt, the new approaching dark age. Asimov isn't for everyone, and I can't admit to loving his prose. But his ideas for plots are top notch. This book, and the series of books that follow it, are proof of this. Asimov's writing is often considered too dense for the casual reader, and there's some truth to this. If you like your science fiction with lots of action and ray guns and alien spaceships flying about, Asimov isn't for you. But if you like hard science fiction based upon hard, indepth science, this Asimov is probably right for you, especially the Foundation series. I first stumbled upon this series back in the early 1980s. In a bid to expand my reading experiences, it was a selection I ordered from the Science Fiction Book Club. It was my first experience with hard science fiction, and though it wasn't enough to become a major fan of the genre, it was enough to make me realize the genius of author Isaac Asimov and the potential for hard science fiction. From time to time I'll still read some hard science fiction, but as is the case with me and overly literary fiction, it's something I enjoy from an educational and intellectual viewpoint, but it's not something my mind can digest on a regular basis without some mental strain and outright boredom. So, I space out my readings of such material. Still, Foundation and the rest of Asimov's books in this series are worth reading for the education alone. These novels can really get you thinking, and can open your mind to much of what science fiction has to offer at its deepest core. The Girl Who Loved Tom Gordon is a small novel. Not only is it a short novel, a little larger than a novella, but it is small in scope. At least compared to many of the works of its author, Stephen King, who has been known to pen many a lengthy tale, sometimes into the thousands of pages. I read an interview with King once in which he said something along the line that he wrote two types of novels, one with the focus upon a single character and another which focused upon many characters. The Girl Who Loved Tom Gordon focuses upon one character, 9-year-old Trisha. The plot is quite simple. During a hiking trip with her mother and brother, Trisha becomes lost in the deep woods. Her story is one of survival. But it's also a bit more than that. For an adult, this would be a story about madness, the madness of facing one's imminent death while stranded in an isolated place with little food, water, shelter or protection of any kind. For Trisha, the tale borders on madness, but is more about a child's willingness to adapt and overcome one's own fears. This is by no means one of King's most popular novels. In truth, I've run across a number of his fans who detest this book. I'm not one of them. Actually, I think it's one of the best things he wrote in the 1990s, the book itself having been released in 1999. Why do I like this book so much? Despite the darkness it sinks into, especially concerning a child, it is in the end one of the most uplifting tales I've ever read. It is about the spirit of survival in all of us, a spirit of survival that focuses upon the humanity in all of us, not because of ties to any particular nation or religion or what-have-you. It is a novel of high spirits, of the links that can bring all of us together as human beings. That is why I love this book. And since it concerns a child, I'll let the reader know that despite the horrific elements of this tale, it is one most appropriate to a child. Should you read it to your own kid? Well, read it yourself and judge for yourself. I personally wouldn't have a problem reading it to a 10-year-old, but I tend to think kids are much more versatile than most of us give them credit. But then, I don't have kids of my own, so who am I to say? Oh, and if you need to know who Tom Gordon is, he was a professional baseball player, at one time a pitcher for the Boston Red Sox, of which King is a huge fan. And yes, he is quite important to this story. Not as a character, but as a figure of myth, as someone to believe in, almost as an Arthurian figure in some ways, or perhaps a Merlin figure would be more appropriate. Waking amid battle, the warrior Bayne has no recollection of his past, of his life, of himself. Believing the mad emperor-mage Verkanus holds the keys to his past, Bayne pursues the wizard across years and unto a mountain. Here, Bayne must climb to find Verkanus and to find himself, and among the crags are oddities and dangers never witnessed by lesser men. In part an allegorical tale, the novella Bayne’s Climb is the first part of The Sword of Bayne trilogy. This novella also takes place in the same world as the author’s Kobalos Trilogy, but nearly 2,000 years before the events of those books. In case you haven't guessed by now, my novella, Bayne's Climb: Part I of The Sword of Bayne, is now available in e-book formats. It's been available for about a week, but I put off doing any promotions for it because I wanted to give all the different retailers time to get all the info up on their sites. For now, this novella is selling for only 99 cents, though I might raise the price to $2.99 eventually. This was a different type of project for me in several ways. It's somewhat literary, somewhat allegorical, somewhat Sword & Sorcery. My beta readers for this novella have surprised me on the literary front by thinking certain things in the story stood for ideas or "things" in the actual, modern real world. The truth is, I wasn't trying to make any intentional social commentary, at least not consciously. The story is also different for me in several ways. The plot is linear. That was intentional. I wanted to tell a story straight through (with one exception, a flashback toward the end) with a very simple plot. I suppose I could be accused of pushing back characterization and plot for the sake of my ideas, but I'm not hiding from that notion. Also, there is some action in this tale, but not an abundance. The violence within Bayne's Climb tends to come in great big whallops, then flitter away for a while before returning once more. The same type of writing will continue through the next two novellas in this trilogy. I am already at work on the second novella in this series, and hope to have it finished and ready for readers in January. Will it succeed? Hell if I know. The readers will have to decide. But at only 40,000 words, hopefully it won't take up too much time for any readers who loathe the tale. And what would this new revolution in publishing be without some experimentation? And what's next after I finish with this trilogy of novellas? I'm not sure yet, but probably something more traditional. Perhaps another Kron Darkbow novel (I've got a few hundred ideas). Perhaps a horror novel. Or maybe another literary novel (yes, I've got one, but haven't published it ... yet). Scaramouche is in interesting novel in that in many ways it seems to mirror the works of Alexandre Dumas, specifically the novel The Count of Monte Cristo. Here we have a story set in France at the beginning of the French Revolution. Also, this is a tale of one-man's vengeance against an authority figure who slew a friend. And there's lots of swashbuckling adventure, as well. Considering the similarities between the two novels, it is not uncommon to compare Andre-Louis Moreau, the protagonist of Scaramouche, with Edmond Dantes of The Count of Monte Cristo. In my opinion, Dantes is the more haunted and more drastic figure, though Moreau might be the better swordsman. Also, Dantes depends much more upon his own resources, whereas Moreau seems to have a bit of serendipity that comes to his rescue from time to time. That being said, Scaramouche is also a darn fine read. Though Sabatini's plots are not quite as complicated or strong as those of Dumas, his characters are almost as likable and his writing style is more fluid and more easily digestible by modern readers. Also, I would give Sabatini a slight edge when it comes to action scenes; Dumas could write quite well a good sword fight, but for swiftness and pure joy of action, I give a slight nudge to Sabatini. To be honest, I would like to have read more of this author's work, and so far Scaramouche is the only work of his I've gotten into. At the very least, I'd like to read Sabatini's Captain Blood, though for what it's worth I have seen some of the movie versions. I've been asked before, what is the title in reference to? Scaramouche is the name of a clown-like figure from Italian commedia dell'arte originally from the 17th Century. The commedia dell'arte was sort of a traveling, artistic acting theater, of which there were many in the 16th through 18th centuries in Europe. The main character in the novel Scaramouche eventually joins such an acting troupe and dons the mask of the comedic figure Scaramouche. If you love historical fiction, especially swashbuckling adventure fiction, do yourself a favor and read this novel by Rafael Sabatini. You won't come to regret it. And if you're one of those people who is leery of reading the classics, have no fears here. Though Sabatini was writing early in the 20th Century, his prose comes off as pretty modern and easy to read.